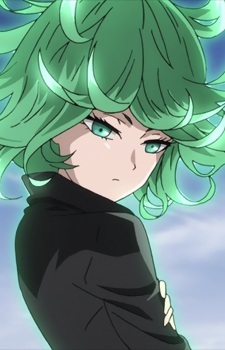 Tatsumaki is the S-Class, Rank 2 superhero and the older sister of Fubuki. Tatsumaki is a petite woman, commonly mistaken for being much younger than she really is. She has a youthful face with wide emerald green eyes and hair that curls up on the ends. She wears a formfitting black dress with long sleeves and four high-cut leg slits that show off her legs and low-heeled black shoes. Being the second ranked S-Class hero, Tatsumaki is very powerful. She is one of the most powerful heroes and the most powerful esper alive. Fubuki describes her as a monster much like Amai Mask, who chooses not to advance from A-Class to S-Class to not allow weaklings to rank up. Even after witnessing Saitama's display of power in the fight against her, Fubuki is convinced that Saitama is nowhere near her older sister in terms of strength and fighting ability. Happy St. Patrick's Day! Anime hair comes in all colors of the rainbow, including the tranquil shade of nature: green. From deep emerald to refreshing mint, here are the top Favorited anime girls with green hair, as ranked on MAL!